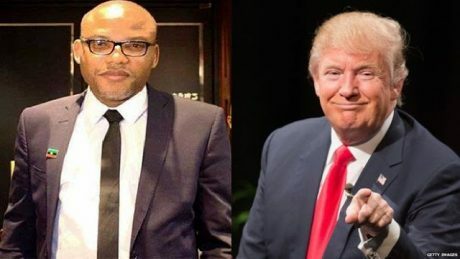 Since the new President-elect of the United States of America Donald Trump was elected on Wednesday, November 9, the Indigenous People of Biafra have congratulated hi, and even listed major things the US government will benefit from the actualization of Bifara. Although no response has been received or heard from Trump on the matter, the group, today, November 14, went ahead to advise the US president elect on how to start his administration. The IPOB in a new statement said the US President-elect must first cleanse the White House in Washington DC before parking in with his family. The statement signed by the spokesperson for the IPOB, Powerful Emma said the advise is necessary because of the romance the US president Barack Obama had with the Islamization agenda around the world. The group said Trump must first bring powerful men of God to cleanse the White House before parking in if he wants to succeed. IPOB also said the US President-elect to make sure his government bring back the face of God Almighty to America again. The Indigenous Peoples of Biafra ( IPOB) has advised the US President- elect, Donald Trump to ensure he embarked on spiritual cleansing of oval office at the White House before moving into it after his swearing in on January 20. 2017. IPOB worldwide gave it as an advice to the president elect Mr. Donald J Trump which had become necessary because of the romance of the current occupant of the American seat of power with the Islamisation agenda around the world. The indigenous people of Biafra IPOB expressed displeasure that the incumbent President Obama chose to depart from the core values of America , a country founded on God to pursue the total Islamisation agenda against the Christian communities and against the wish of Americans. We the Indigenous Peoples of Biafra want to advise America President- elect , Donald Trump to first bring powerful men of God to cleanse the White House before parking in if he wants to succeed and make sure his government bring back the face of God Almighty to America again. He should rededicate America to God Almighty if he truly wants to make America great again. Obama administration has defiled White House through his open romance with the Islamic world. God is unhappy with the US because Obama has forsaken the godly principles of the founding fathers of America who preached for the face of God Almighty in everything America do, even America wrote IN GOD WE TRUST in their currency and other important things in America that is a sign to proof that America is a God’s own nation. We will not be surprised if he may have dedicated White House to strange gods. This is why God rejected him and his candidate Hillary Clinton because God wants to restore the lost glory of America. IPOB also urged Trump to bring Obama to the International Criminal Court at the Hague ( ICC) to face criminal charges for keeping silent over mass killings of innocent and unarmed freedom fighters in different parts of the world particularly the peaceful Biafran agitators. Obama should be made to face criminal charges for refusing to stop the mass killing of Biafran agitators by security agents in Nigeria under the watch of his friend President Muhammadu Buhari. Obama should be made to account for the thousands of Biafran agitators massacred by security agents in Nigeria because he refused to condemn the atrocities and excesses of the oppressors across the globe. Obama is fully aware of the daily killings and raids of Southern communities in Nigeria by Fulani herdsmen but never for one day condemned the atrocities because he has soft spot for Muslims. Men and women including children were slaughtered like cows by the rampaging herdsmen disguised as cattle rearers yet Obama never frowned at them. They ripped open the bellies of pregnant women killing both the mother and baby, yet Obama never condemned them because the perpetrators are Muslims. Barack Obama reluctantly branded Boko Haram as terror organisation after they had massacred thousands of innocent souls mostly Christians and Southerners in Nigeria. Islamic fundamentalists burn down churches and behead Christians without provocation yet Obama has never condemned their evil or pressurize his friend Buhari the president of Nigeria to call them to order. Again, we thanked the newly president elect of USA mr Donald J Trump on the necessary move he made to stop the arm deal business between Brazil government and Nigeria government. The arm deal business was to use it kill unarmed IPOB and Biafrans who were doing peaceful protest against the illegal detention of mazi Nnamdi Kanu and other Biafrians detained illegally in all the prisons and security cells across the country. America has a divine mandate of being the police of the whole world but Obama abandoned this and pursued an unholy agenda. For this negligence of duty and conspiracy of silence Obama should be made to answer for his in actions at ICC. IPOB dismissed those protesting Trump’s emergence as brainwashed and Islamized Americans and paid citizens of Americans who have lost understanding of the times and the grand plot of the Islamic world to gain control of America through Obama and Clinton. MAY GOD BLESS TRUMP ADMINISTRATION AND GOD’S OWN NATION AMERICA.